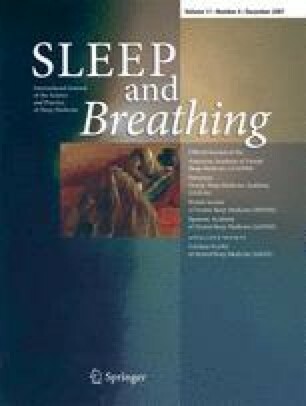 In the narrowed upper airway of patients with obstructive sleep apnea (OSA), a neuromuscular compensatory mechanism augments the activity of the upper airway dilator muscles in defense of upper airway patency, particularly during inspiration. We hypothesized that mechanical enlargement of the upper airway by a mandibular advancement oral appliance would permit a reduction in this neuromuscular compensation during wakefulness. To test this hypothesis, we focused on changes in the cross-sectional (CS) area of the upper airway before and after emplacement of a ventrally titrated oral appliance in 12 awake OSA patients. The CS areas at the end of tidal expiration (CS area-EET) and at the nadir of intraluminal pressure during inspiration (CS area-IN) were obtained using videoendoscopy. The median apnea–hypopnea index decreased with mandibular advancement. Before mandibular advancement, there was no difference between CS area-EET and CS area-IN in the velopharynx, oropharynx, and hypopharynx. This indicates that upper airway dilator muscle activity increased during inspiration to counteract the intraluminal negative pressure of the upper airway. After mandibular advancement, CS area-EET increased in the velopharynx, oropharynx, and hypopharynx, but CS area-IN was unchanged at any level and was less than CS area-EET in the velopharynx and oropharynx. These findings suggest that mandibular advancement enlarges the upper airway and may reduce upper airway dilator muscle activity during inspiration. We conclude that oral appliances act to return the upper airway towards a normal configuration and pattern of muscle function in OSA patients. The authors would like to thank Mrs. Ingrid Ellis for her editorial expertise. This study was supported by the British Columbia Health Research Foundation and the Canadian Respiratory Health Network of Centres of Excellence (Inspiraplex) and Grants-in-Aid for Scientific Research Projects (18791581) from the Japanese Ministry of Education, Culture, Sports, Science and Technology. The international patents of the Klearway™ appliance have been obtained by The University of British Columbia, and specific licensees are assigned the rights to manufacture and distribute the appliance worldwide.